RESULT Sports is known worldwide for its Digital Platform, focusing on the analytics, monitoring and visualisation of current statuses of Digital Media in Sports. Our latest study provides a holistic overview on the ever increasing relevance and impact of #eSports within Sports organisations. eSports comes from electronic sports and is an ‘umbrella term’ for competitive video gaming. It has been around for many years, but the global eSports market has been growing very rapidly, especially in the past couple of years and this growth is expected to continue for the foreseeable future. Revenues for eSports are expected to hit $696M in 2017, a year-on-year growth of 41.3%. Beşiktaş Istanbul are considered pioneers of eSports in sporting organisations. The Turkish side launched a league of legends team in January 2015. Whether there was a dedicated strategy behind the Besiktas initiative is not fully known, but since then, there is literally a run of sports clubs joining eSports. 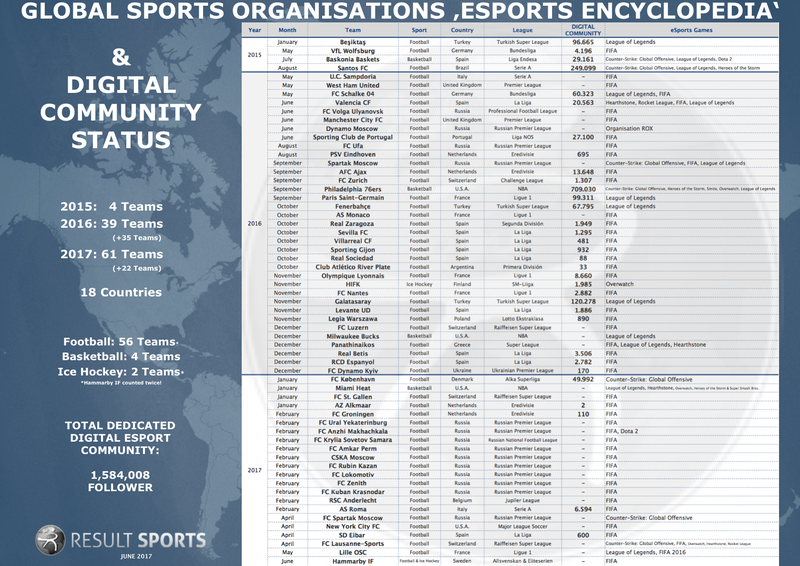 Until today, a total of 60 clubs and organisations engaged in eSports. Which sports organisation is active? Who is offering which game? When did they launch their eSports activities? Do they offer a dedicated digital media offering? How large is currently the digital community? As of June 25th 2017 there are 61 sports organisations on three continents and in 18 countries active in eSports. The majority are football clubs (56), which are all active on FIFA. Four Basketball teams including Baskonia Baskets, the third sports organisation to launch a dedicated eSports team overall, and two Ice Hockey teams complete the list. League of Legends and Counter-Strike: Global Offensive are the ‘preferred’ games outside of sports. Since 2010 RESULT has been monitoring social platforms. We currently monitor 25+ digital platforms in active use by athletes, clubs, leagues, federations & associations. Our evaluation of data is structured and analysed in detail, allowing for sporting bodies and their rights-holders to spot trends, evaluate opportunities and get the most from their digital activity. As with everything we do in-house, our market leading digital monitoring follows a RESULT Sports quality process. The eSports encyclopedia will be regularly modified!